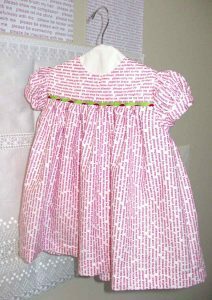 A simple toddler’s dress. But a closer reading of the fabric text reveals a child’s voice of deliverance and directives for love and care. I composed the phrases of text in Photoshop, and the cotton fabric was printed by an online company used by TV’s Project Runway contestants. I researched online for a baby dress pattern printed in 1951, my birth year, and found McCall’s pattern #1640. The lime green grosgrain ribbon with ladybugs references my childhood nickname “ladybug” used by my maternal grandmother. Part of the Self series, ‘Please See Me: The Ladybug Dress‘, is for for sale, along with a small hanger and custom-made white cotton cover. It can be displayed in an acrylic box, on a mannequin, hanging, or simply laid out. Truly a labor of love. A unique piece of fiber art. ‘Please See Me: The Ladybug Dress’ won the Massachusetts College of Art and Design 2017 All School Show Award for Fibers.